Werfenweng lies on a plateau surrounded by magnificent mountains, and as such is a hikers’ paradise. 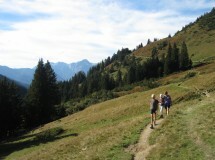 Gorgeous hiking routes are found both in the valley and at higher altitudes, with offerings for all difficulty levels. There are also five signpost-marked Nordic walking routes. The gondola from the Bergbahnen Werfenweng transports hikers to the 1850m high Bischlinghöhe.